The main components of the FLS are colored door markers, which are designed in the respective color of the building complex and are marked with the floor number or the room number. The numbering sequence is made according to the beaded cord principle (ascending or descending room numbers). The door markers are located on the inside as well as the outside of the doors so that in an emergency the persons in a room, with the individual room identification, can request assistance as quickly as possible. In principle, the door marker should end no more than 5 cm below the lock rosette or the fitting. For higher doors and special surfaces, the length of the flap or the choice of the adhesive film must be adapted individually. 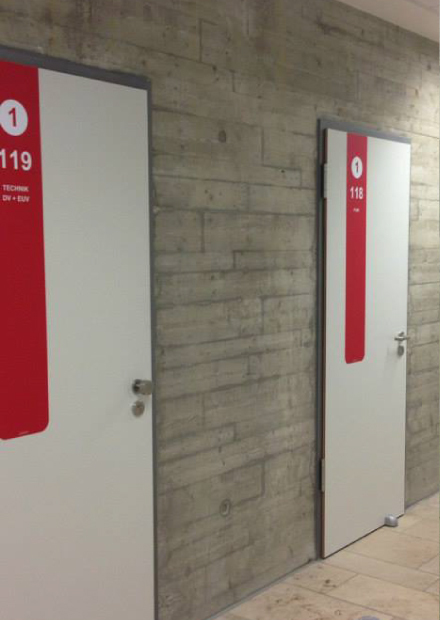 Optionally the technical room numbers of the Schulbauamt are placed in the floor area on the door marker. This flag is mainly used by the administration to link the FLS numbering with an old numbering method. Since these numbers are not part of the guidance system, but a service for the craftsmen and caretakers, the number is given very small and thus treated secondarily.